PantheaCon 2013 is almost upon us and once again The Woven Circle will be teaching two traditional wheat weaving classes at the convention. The Woven Circle is made up of talented artists who travel to San Jose each year to share their enjoyment of straw art with the Pagan community at PantheaCon. Our beginning class “Introduction to Wheat Weaving” will be on Saturday at 3:30 in the San Juan/San Carlos rooms. Last year, we had had to turn away students because of the popularity of this workshop. This class focuses on beginning weaving techniques along with straw preparation and sources on books, materials, and local groups. 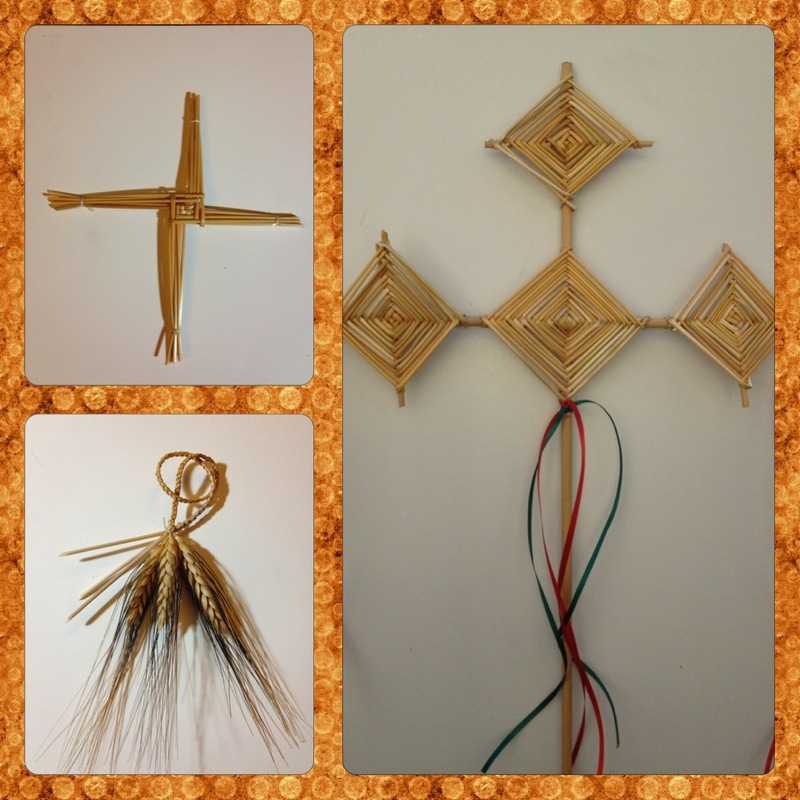 In this class, each student will make at least two pieces of straw art: a Bridget’s Cross and Harvest Knot to bring home. All materials and supplies are provided. We will be teaching an intermediate class “Intermediate Wheat Weaving” on Sunday at 11:00 in San Carlos for those of you who have taken wheat weaving classes or are advanced hand crafters. This class focuses on intermediate weaving techniques. In this class, each student will make a small Bridget’s Processional using locking and adding techniques. All materials and supplies are provided. The Woven Circle (Angela, Carol, Joe, Chris, and William) is dedicated to teaching arts and crafts as part of our service to the community. Angela (The Straw Witch) is an eclectic Pagan writer and has taught crafts for 20 years. Carol is a bead and fiber artist, who has taught for crafts guilds, both local and regional. William (A Pagan Humanist) has been part of the Pagan community for over 30 years and has been teaching wheat weaving for over 15 years. Joe comes to heckle but in reality is a talented straw artist and a great help. Chris stated out by taking these class and now he is a welcome teacher to the group. The American Museum of Straw Art hosts a spectacular collection of straw art from the US and around the world. Also, there is Wheat Goddesses, which is Cora’s web site with her show schedule. Her work is amazing and if you get a chance, please stop by one of her shows to see all the straw art. Also there is a new site for showcasing international straw art which you can find at StrawBlog. This entry was posted in Art, Poetry, & Writing, Classes and Workshops and tagged art, Pagan, PantheaCon, Wheat Weaving. Bookmark the permalink.